James Hogg lived from 1770 to 21 November 1835. Commonly referred to as The Ettrick Shepherd, he was a poet and novelist who wrote in both Scots and English and who became one of the most unlikely literary figures ever to emerge from Scotland. The wider picture at the time is set out in our Historical Timeline. Hogg was born in 1770 at Ettrickhall Farm in Ettrick, and was baptised there on 9 December that year. 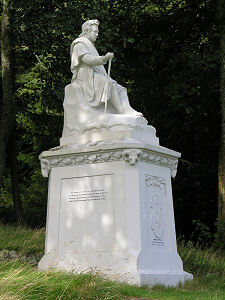 The cottage where he was born is long gone, but a Victorian monument marks the spot. Hogg left school at the age 7 after just six month's education, following the bankruptcy of his father, a sheep-farmer. The young James started work as a cowherd, later becoming a shepherd. A turning point came when he took up a job as shepherd working for a relative of his mother's, James Laidlaw of Blackhouse farm, in Yarrow. Here Hogg had access to a good collection of books; and he began to read widely, and to write. For the rest of his life Hogg earned his living partly through farming and partly as a writer. Hogg also taught himself to play the fiddle, and rapidly began to make a name for himself as "Jamie the Poeter", a singer of traditional ballards and reciter of the rich folklore of the Scottish Borders. In 1796 Robert Burns died, shortly after Hogg had started to explore his work. Hogg's response was to produce poetry of his own. James Laidlaw later introduced Hogg to Sir Walter Scott, who he assisted with his research for The Minstrelsy of the Scottish Border. Hogg published his own collection of poetry and ballads, The Mountain Bard in 1807. He then started a literary magazine, The Spy and by 1813 had been invited by William Blackwood to write for the Edinburgh Magazine. He also produced a practical handbook on sheep diseases. Hogg went on to write a series of successful novels: The Brownie of Bodsbeck (1818); The Three Perils of Man (1822); The Three Perils of Woman (1822); and the book that was widely regarded as his masterpiece, Private Memoirs and Confessions of a Justified Sinner (1824). Hogg became a major star of Edinburgh's literary circles and in 1832 he was offered a knighthood by King George IV, but declined it. Hogg later returned to his native Selkirkshire, where he lived in the Yarrow valley in a farm made available to him rent-free for life by the Duke of Buccleuch, who admired his work. Hogg died in 1835 and was buried in the graveyard at Ettrick Kirk, a few hundred yards away from the memorial marking the location of his birth. At the time of his death he was probably even more famous than Robert Burns, and while he is less widely read today, his influence on Scottish writers has been huge, all the way from from Robert Louis Stevenson to Ian Rankin and Irvine Welsh. 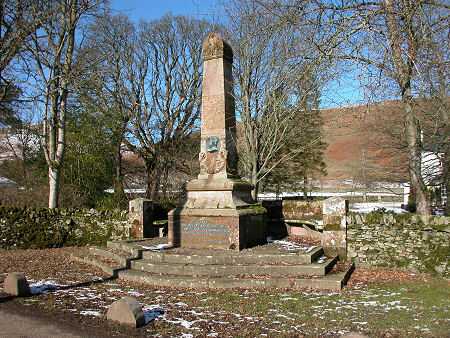 In 1860 the imposing James Hogg Monument was unveiled on a site overlooking St Mary's Loch and Tibbie Shiel's Inn, which he knew well, four miles from Ettrick.